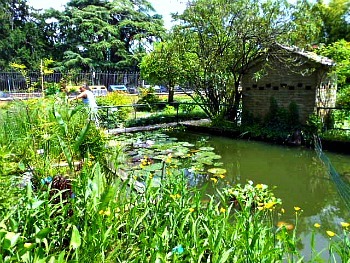 Ferrara Botanical Garden: One of the Most Historic Gardens in Italy. The Ferrara Botanical Garden can be counted among the most notable historic institutions of its kind in Italy. In 1771, with the promulgation of a new reform chart, the University of Ferrara had the possibility to establish a Botanical Garden – known at the time as ‘Giardino dei Semplici’. Although the date of the official institution of the garden is later than that of other well-known horti of the same kind (such as those in Pisa, Padova and Bologna), one should not think that, because of this, botanic research had languished in Ferrara up to then. In fact, a University was active in Ferrara since 1391, which in no time, thanks to the presence of the Estensi – the family who ran the city – became one of the most renowned cultural centres in Italy. During the Reanaissance, the Estensi promoted all kinds of studies, including botanical research, which at the time was comprised within the medical sciences. That favoured the arrival in Ferrara of doctors who also dealt with botany, amongst whom are to be remembered Berengario da Carpi, Leoniceno and Mainardo. Great importance also had Antonio Musa Brasavola – an illustrious medic and plant connoisseur – Gabriele Fallopio and Gian Battista Canani. In such a cultured situation, so conducive to the study of botany, certainly there existed places devoted to the cultivation of medicinal species and other herbs of medical interest. Unfortunately, however, nothing remains pertaining the historical documentation related to the presence of a Botanical Garden – where it could have been located or indeed its very existence. 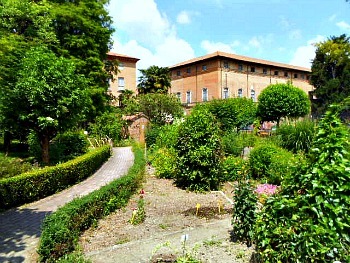 But the betterment of the general situation of the time, due to the reforms of Popes Clemente XIV and Pio VI, actually started a process which was to lead to the institution of a Botanical Garden in Ferrara, originally located in the gardens at via Paradiso, besides the ancient Palazzo Paradiso, seat of the University. In 1772 a catalogue was finally published, including 2800 taxa – of both indigenous and exotic plants – supervised by the then Prefect of the Garden, Francesco Maria Giacomini. After that, at the beginning of the 1800s, the Ferrara Botanical Garden went into the capable hands of Antonio Campana, whose work was carried on by Francesco Jachelli and his son. Since the end of the 1800s and until 1919, the direction of Ferrara Botanical Garden was given to Professor Carlo Massalongo, an eminent scholar who, however, could not prevent the transfer of the Garden from via Paradiso to via Scandiana – in a completely unsuitable site, as it was lamented by Professor Eugenio Baroni, to whom the direction of the Garden was entrusted from 1922 to 1929. Only in 1925 was Ferrara Botanical Garden moved back to its original site, and there it remained until 1963 – year in which it was finally transferred to the grounds of the 16th century-built Palazzo Turchi-Di Bagno, where it still is (the picture at the top of the page shows the entrance to the gardens – the site is small but well-packed with plants – with the main glasshouses to one side; in the image below the other, minor glasshouses with specific collections can be seen facing directly opposite). – Tropical and Sub-tropical plants: Exotic Ferns (epiphytes; tree-ferns and tropical ferns); Exotic Gymnosperms (Cycads, Podocarpus sp. and other similar species); Exotic water-loving plants (tropical and sub-tropical sun-loving and water-loving species); Sensitive plants (Mimosa pudica and other species similarly sensitive to mechanic stimuli); Cacti (succulent plants from desert habitats worldwide); Epiphyte plants (Bromeliads and other species that grow on trees); Epiphyte succulents (Cacti and other similar species growing on trees); Officinal exotic plants (edible, medicinal, aromatic and poisonous species of extra-European origin); Epiphyte orchids (exotic orchids from forest habitats worldwide); Western exotic plants (species from the tropical regions of Africa and America); Eastern exotic plants (species from the tropical regions of Asia and Oceania); Carnivorous plants (species that feed on small insects; see picture of the glasshouse below); Bananas (Musa sapientum and other Musa species); Palm bed (Trachycarpus fortunei and other Arecaceae). The five sections presented above are scattered throughout the garden and mixed; it is therefore not possible to follow them regularly when planning a visit route. However – even though packed full of plants – the site is relatively small, so that an approximate description of the route can be presented here. 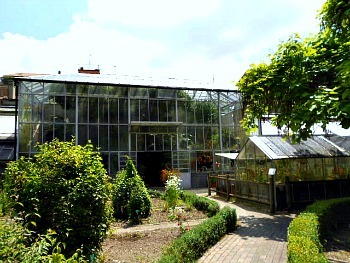 At the entrance of the gardens, to the left, are the main glasshouses, containing most of the Tropical and Sub-tropical plants (see the two pictures above). 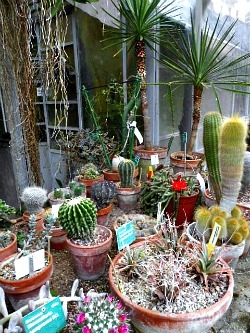 Inside these are the Cacti collections, and most of the other sectors found in the Tropical and Sub-tropical section (an image of the succulents' collections is presented below). 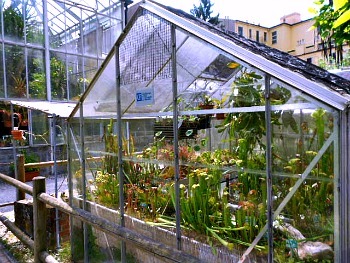 On the other side, facing right opposite the main glasshouses are a few smaller glasshouses hosting more specific collections that require a particular micro-climate and conditions, such as the carnivorous plants (pictured two images above) or those species coming from desert habitats. 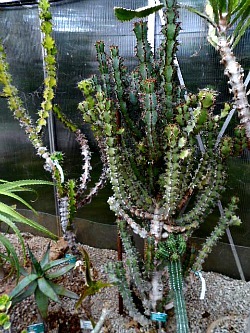 An example is given in the picture below, which displays a beautiful specimen of Euphorbia coerulescens – a typical desert cactus. 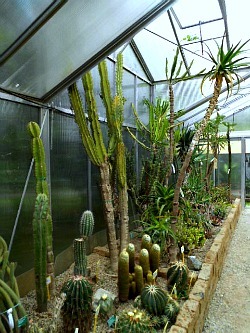 The following image shows the interior of the desert glasshouse. 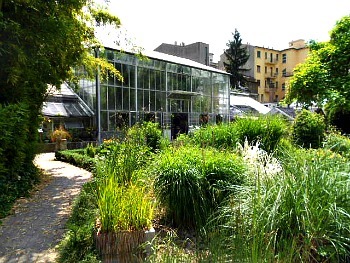 The garden then develops mostly to the right of the glasshouses, in a square plot. The Ferrara Botanical Garden is in fact right at the heart of the 16th century expansion of the city (the so-called 'Addizione Erculea'), and some of the monumental buildings of this area are visible on the background of the picture shown below; the renowned Palazzo dei Diamanti is literally two minutes' walk away. Inside this section, the first areas to be encountered are the beds that contain useful plants (aromatic and medicinal; see image below). Proceeding further, one encounters the pond area, reproducing wetland habitats, where most hygrophylous (water-loving) plants can be found (see picture below). Further still, one reaches the corner where the administration offices and other services are located (that is, at the other end of the garden). 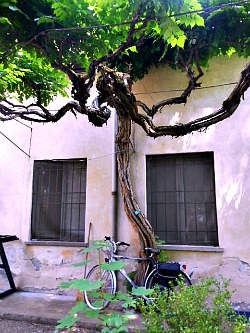 In this part of Ferrara Botanical Garden are taken out the tropical and sub-tropical plants that can stay outdoors during the summer months; there is also an old specimen of a beautiful climber, Campsis radicans, which grows against the wall of the service building. Turning back from this building now, in the closing image below is a view on the palms' collection, which is only taken out for the summer; the Corso Porta Mare – where the entrance to Ferrara Botanical Garden is – runs just beside. 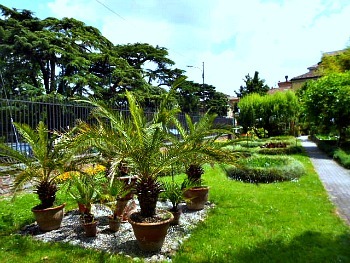 On the other side of the road is another historic garden, Giardino Massari, with several old trees; two majestic specimens of Cedrus atlantica can just be glimpsed in the picture.